Greene Tweed’s global customers rely on the company’s materials expertise, custom engineered solutions, and collaborative approach to design and manufacture elastomeric, thermoplastic, and thermoplastic composite solutions that deliver proven performance within extreme and demanding operating environments. To support sustained market growth and satisfy demand surges, Greene Tweed has proactively expanded capacity of its manufacturing facilities over the past four years, using Copy Exactly! methodology to ensure product equivalency with supporting data. With manufacturing facilities located throughout North America, Europe, and Asia, Greene Tweed is uniquely positioned to serve its customers within their local markets. Capacity expansion is accomplished using Copy Exactly!, a design and process change management approach that ensures physical and functional interchangeability of components and spare parts, while utilizing stringent manufacturing best practices. 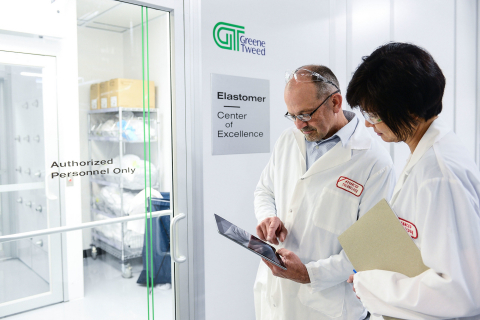 As part of the company’s dedication to ongoing manufacturing excellence, and due to the continuous, rapid growth in the semiconductor market, Greene Tweed has embarked on a 3-year factory innovation and technology transformation program called The Right FITT™. The Right FITT™ incorporates Industry 4.0 best practices to expand manufacturing capability at existing facilities to ensure surge capacity and enable sustained market growth scalability. The Right FITT™ includes the introduction of innovative manufacturing technology, new data systems and controls, and a three-phase maintenance improvement plan with a goal of zero equipment stoppages. Production benefits include the ability to make real-time product adjustments and provide enhanced customer order tracking capabilities. Combined with Greene Tweed’s Copy Exactly! methodology and global footprint, The Right FITT™ will introduce even greater efficiencies and process improvements to the company’s longstanding reputation of consistent global quality and service delivery. Greene Tweed is a leading global manufacturer of high-performance seals and engineered components. Combining more than 150 years of technical expertise and commercial knowledge in a variety of markets, Greene Tweed collaborates with customers to develop engineered solutions that meet challenging performance requirements and reduce total cost of ownership. Greene Tweed products are sold and distributed worldwide. For additional information, contact Greene Tweed at +1.215.256.9521 or visit our website at www.gtweed.com.